Det är en översta våningen lägenhet i en typisk byggnad av "Ensanche". Det har totalrenoverats hålla huvuddragen i sin "Ensanche Barcelona" stil. Den har en säkerhet ytterdörren. Det är mycket bra beläget, i en radio av en halv timmes promenad du har de flesta av de viktigaste turistattraktioner. Det finns mycket bra restauranger i närheten. Det är nära till tre tunnelbanestationer. Flygplatsen ligger på 15 min. Höghastighetståg Station (AVE station) är 10 minuters promenad. Det finns en parkeringsplats gratis. I köket finns en vulkanisk sten grill. Det finns en utomhus hydda i leken. Brickan är i enheten inuti stugan. En flaska kvalitet spanskt vin som en välkommen. Great location, clean, quiet and very safe. When we met Fidel at the unit, he was very helpful and thorough in explaining to us the locations of restaurants, nearby markets and directions to these places and to the metro. The unit is well appointed, very comfortable, and my daughter and I very much enjoyed our time here. It was so nice at the end of each day to come back to the unit, feeling relaxed, safe and appreciated how quiet it was for a good night's sleep. I would definitely stay here and again and highly recommend it to anyone coming to Barcelona. Thank you very much for your nice review of my property, it's very helpful to continue increasing my work to report my guests about the apartment and Barcelona. Loved the apartment, terrace, boulevarde & the owner Fidel was charming & informative. We are a family of four with two teenagers and enjoyed our stay immensely. Thank you Fidel & Barcelona. My brother and I stayed here starting last week of June and we would be happy to stay here again. It was a clean and comfortable apartment in a safe and convenient location. It’s between Rocafort and Entenca metro stations (different lines) and an easy stroll to Parc Joan Miro where it is lovely to go onto the roof of the nearby Arena which has a 360 degree view over Barcelona. We felt safe walking in the area and in the metro even late at night. Close to plenty of grocery shops/supermarkets and cafes. The apartment looks out onto a square of other apartments but as it is the top (5th) floor it is bright and feels open as you can see beyond to the castle and chairlifts up on Montjuic. The aircon is based in the lounge but cools the bedrooms too. Good double glazing mean the apartment is quiet as traffic can be noisy otherwise. The other people in the block seemed friendly (residential but at least one other apartment was probably holidaymakers). There is lots of wardrobe and drawer space for clothes although it is all in the one bedroom. There are a row of clothes hooks in the second bedroom and I also used the steps/ladder to the top bunk as shelving. The only niggles were that one of the two rings on the cooker is tricky to light, we couldn’t find a kettle so used a saucepan and also it would be useful to have a casserole dish for use in the oven. All in all we were very comfortable and enjoyed staying here. Although we were only at this place for three days, the apartment is exactly as described. This charming flat is centrally located in a residential neighborhood that is always within a 10 minute walk to an adventure no matter which direction you head out. The rooftop deck space more than makes up for the cozy living spaces inside. It wasn't an issue since we came to Barcelona to explore the city not to stay inside an apartment rental. To that end, this place will meet most of your expectations. I would highly recommend staying here especially since Fidel is a pleasant person to deal with . The only reason I'm giving it 4 stars is because it was lacking the creature comforts that I come to expect when renting places, where I want to feel at home after long travels or being out in the streets all day. Some more decor, linens on the beds as opposed to being stored away and comfortable pillows will improve the hospitality for this otherwise wonderful rental. Convenient location and good value! My two children and I stayed here for three nights during our stay in Barcelona. 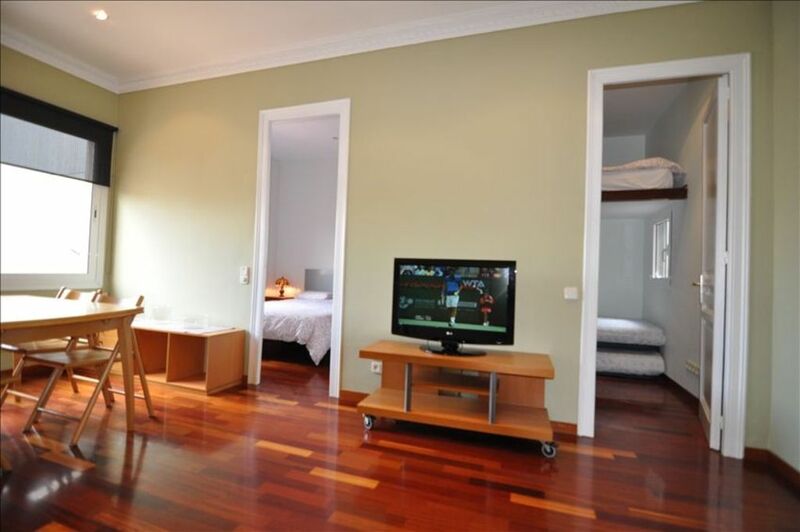 The apartment was located in convenient location - in Eixample. The neighbourhood itself is a more working class area and not overly touristy. However, it is located 3 blocks from the metro which can get you to more central locations very quickly. The apartment was clean and very functional and the air conditioning unit was a big help given how hot Barcelona was in August. The owners were very helpful and even left us a bottle of wine as a welcome gift! The owners also left a great list of recommendations for restaurants and other things you might need. We highly recommend the Pizza place - Gioconda - just outside the apartment. We enjoyed a couple of meals there - good food and very reasonable price. I would also agree that the apartment was quiet at night. The rooftop patio is a nice extra treat. So, while the apartment is not big on "character", it was clean, safe, comfortable, and good value for us! We would stay here again and recommend it for others as well. Thank you very much for your nice review, that helps me a lot to contimue mamtsining a nice place for new guests. The air conditioning was a welcome relief from the muggy August temperatures. Place was exactly as advertised. Nice bathroom. Easy to get around Barcelona from here. Would have preferred written check-in instructions in advance of arrival, but overall a pleasant stay. Lägenheten ligger mycket nära Barcelonas mässa.